Tendons attach muscles to bones, transmitting the forces produced by the muscles, moving joints. Tendons also have sensory nerves that communicate information about muscle tension and joint position to the brain. Tendons and ligaments have limited capacity to stretch and do not contract. Practicing yoga improves tendon and ligament flexibility, especially when performed in a heated room. Practitioners should not stretch tendons or ligaments beyond their normal length as this can cause injury. Muscles are also defined by the number of joints that they cross from their origin to their insertion. Monoarticular muscles cross only one joint while polyarticular muscles cross more than one joint. When monoarticular muscles contract they primarily move only one joint. When polyarticular muscles contract they can move multiple joints. 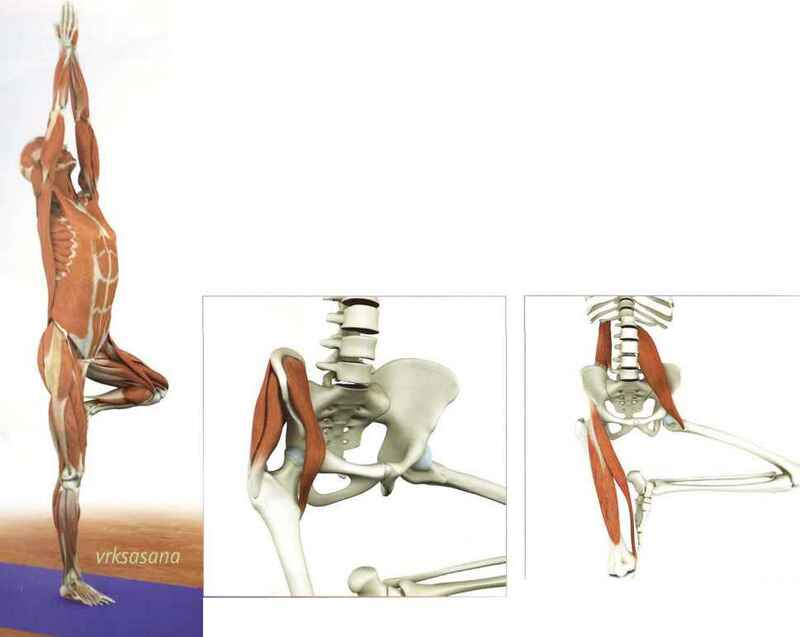 For example, in the one-legged vrksasana the iliacus and gluteus medius represent monoarticular muscles because they originate on the ilium and attach to the proximal femur, crossing (and moving) only the hip joint. 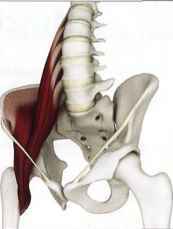 Here the iliacus and gluteus medius serve to stabilize the hip joint in the standing leg. The quadratus lumborum, psoas, rectus femoris and sartorius represent polyarticular muscles because they all cross (and move) multiple joints. Here these muscles contribute to flexing, abducting and externally rotating the non-standing leg. Muscle fibers contract in response to afferant nerve stimuli (from the central nervous system). This is an active, energy-dependent process involving the release of calcium at the cellular level of the muscle fiber. Calcium then forms cross bridging between the myofilaments (of the myofibril). This causes a "ratcheting" effect that results in the shortening or contraction of the individual muscle fiber. The net effect of this process is shortening or contraction of the entire muscle. The force of this contraction is transmitted to the non-contractile fascial elements surrounding the muscle. These fascial elements then transmit this force to the myotendon junction and on to the bones, moving the joint. Muscle fibers are the functional contractile units of each skeletal muscle. 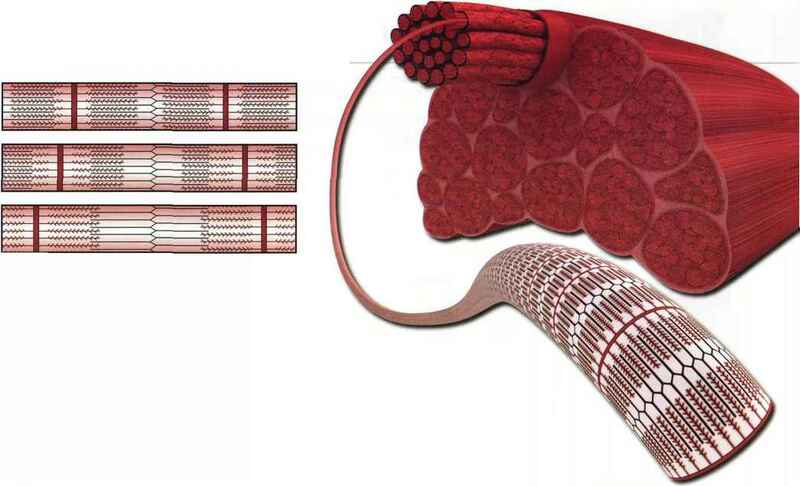 Fibers are grouped into fascicles which in turn are grouped into bundles, thus forming the individual skeletal muscles. contractile elements include the connective tissue sheath surrounding the muscle bundles, fascicles and individual fibers, as well as the myotendon junction. 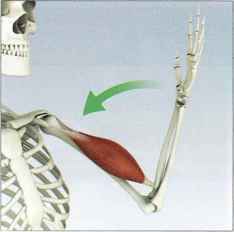 Muscles exist in either a contracted, relaxed or stretched state. This is illustrated above in the inset showing the cross bridging of myofilaments. The muscle shortens while maintaining constant tension through a range of motion. Eccentric contraction The muscle contracts while lengthening. The muscle generates tension but does not shorten, and the bones do not move. Do monoarticular muscles cross at joint? What is a polyarticular muscle? What are the functions of the tendons and ligaments? 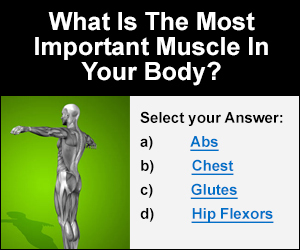 What are is the monoarticular gluteus maximus? Where do tendons of the iliacus muscles attach? What is poly articular muscles?